More than 100 years ago, the Titanic was the largest cruise ship on the water. But today, a ship that’s twice as high and twice as wide is the new queen of the sea. With 18 decks and seven “neighborhoods,” Royal Caribbean’s Symphony of the Seas is the world’s largest (and newest) cruise ship. 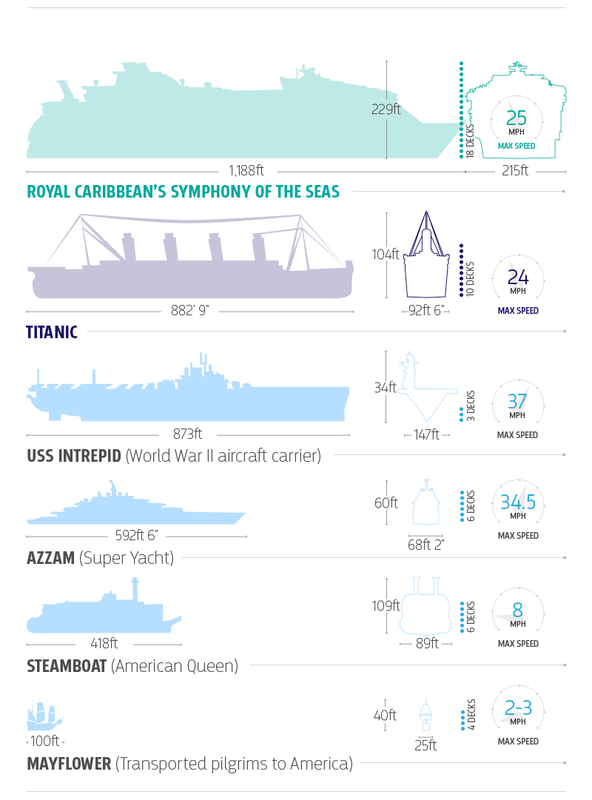 In order to fully comprehend the ship’s massive size, we put together this infographic to show how it stacks up against other historic vessels. With a ship of this size, it’s hard to put things into perspective, but we’ll try our best. At a staggering 1,188 feet, Royal Caribbean’s Symphony of the Seas is as long as the Empire State building without its antennas. It’s also nearly six times longer than a Boeing 787 passenger jet airplane. If we take a peek inside the ship, the numbers continue to amaze. Symphony of the Seas has a capacity of 8,880, including 6,680 passengers and 2,200 crew members, which may seem like things could get crowded, but considering there are seven neighborhoods inside the ship (yes, seven), there’s plenty of space to stretch out and relax. Those neighborhoods host 26 lounges and bars, 9 Jacuzzis, spas, swimming pools, restaurants, a laser tag arena, ice skating, theaters and more than 12,000 trees and plants. Oh, and that’s not to mention the 2,759 staterooms and 24 guest elevators. 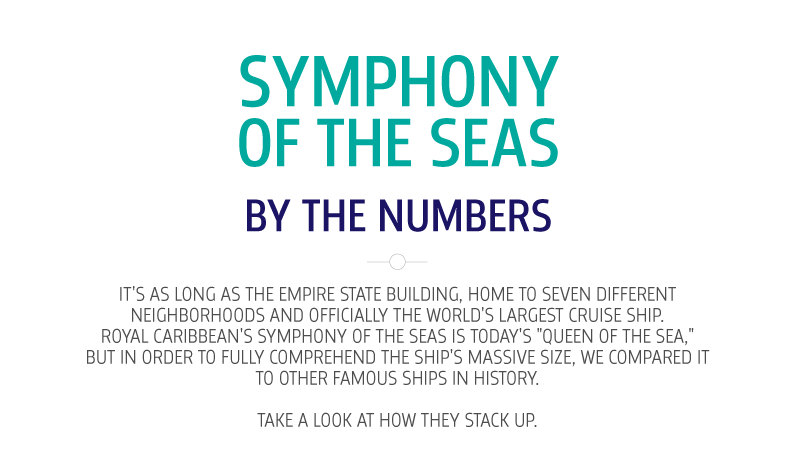 When we compare the ship’s capacity to the Titanic, Symphony of the Seas can hold 5,542 more people than the Titanic. Surprisingly, the only area that Titanic has Symphony of the Seas beat is speed, but not by much. At 25 MPH, Titanic’s max speed is 1 MPH faster than Symphony of the Seas. In terms of amenities, Titanic’s squash court and smoking rooms were popular among its guests, but one of the most notable features was the ship’s grand staircase, which featured wrought iron and a glass dome with a large chandelier above it. While luxurious at the time, they definitely don’t compare to Symphony of the Sea’s 40-foot-long surfing simulator and 10-story slide. So what’s the price tag to build the world’s largest cruise ship? 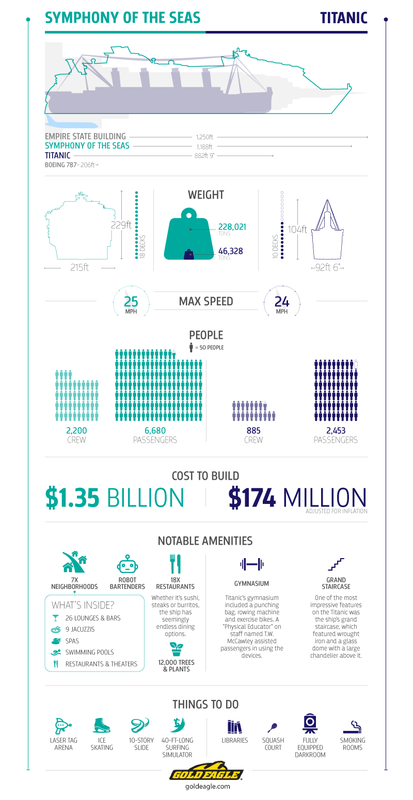 Symphony of the Seas cost an astounding $1.35 billion to build, but judging by its size and features, it was probably worth every penny! Titanic’s maximum speed was not 25 MPH. 25 MPH is approximately 21 knots, which is Olympic and Titanic’s service speed when they first entered service. Titanic collided against the iceberg at 22 knots, which isn’t even close to her maximum speed. In order for them to achieve their 21 knots service speed, it was necessary for her engines to develop 46,000 HP, but additonal power was provided to ensure that they could maintain this speed through bad weather consitions frequently found on the Atlantic. While their registration documents stated the engines were registered at a total of 50,000 hp, Edward Wilding of Harland & Wolff confirmed that she could generate over 55,000 HP. In fact, running at full speed, they produced around 59,000 HP. That said, since both Olympic and Titanic were built with the same machinery, they would have the same speed specifications. RMS Olympic’s service speed, for example changed to 23 knots in 1933. And she even achieved a speed of 25 knots during her fourteen-hour all-out speed run towards her sinking sister, however even this wasn’t her maximum speed, as it would’ve taken possibly 12 hours for all of Olympic’s extra boilers to become operational and at their optimal pressure. As far as Olympic’s speed goes, the fastest recorded speed she achieved was on August 4, 1914 which clocked in at 25.1 knots. So, Titanic’s maximum speed (excluding her extra boilers) would’ve been 25 knots. It’s safe to say that if her extra boilers were included it would total to about 26 or 27 knots.